When a chef is looking for wholesale kitchenware and gadgets for her commercial kitchen, she wants to find an assortment of items that are durable. Anyone working in a commercial kitchen must maintain health code standards to avoid contaminating food during its preparation. This means that a chef must have multiple items for their kitchen, including sets of skillets, saucepans and Dutch ovens. To stir ingredients in mixing bowls, a chef must have metal whisks that are easy to wash between uses. 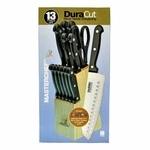 To slice meats and vegetables, a chef requires various knives, and to protect the sharp blades; they should have a high-quality wooden knife block. When a chef wants to peel vegetables such as potatoes or carrots, it is easier to use a produce peeler that removes a thin layer. If an inspector enters a commercial kitchen, then he will expect to see the chef switching to a clean peeler when they are preparing different types of vegetables. Many commercial kitchens need cookie sheets to use for baking desserts, meat or pizza. If a chef prepares hundreds of meals each day, she will require many cookie sheets. To cut pizza, it is easier to use a metal pizza cutter rather than a sharp knife. A pizza cutter has a sharp wheel that slides over and through the pizza dough to create slices of the food for customers. To prepare many recipes, a commercial kitchen’s chef must use a can opener to open containers of sauces, vegetables, and fruit. Health code regulations require using a different can opener for particular types of foods. Also, a chef must sanitize a can opener in hot water to destroy dangerous bacteria. When a chef needs to order can openers for her kitchen, she wants to buy several at one time. A commercial kitchen’s chef must order long-handled slotted and solid stirring spoons to stir and serve foods to customers.